For more information about this tool, please visit the official repository at Github here. Now you can run the scripts in order to perform the attack on the next steps. 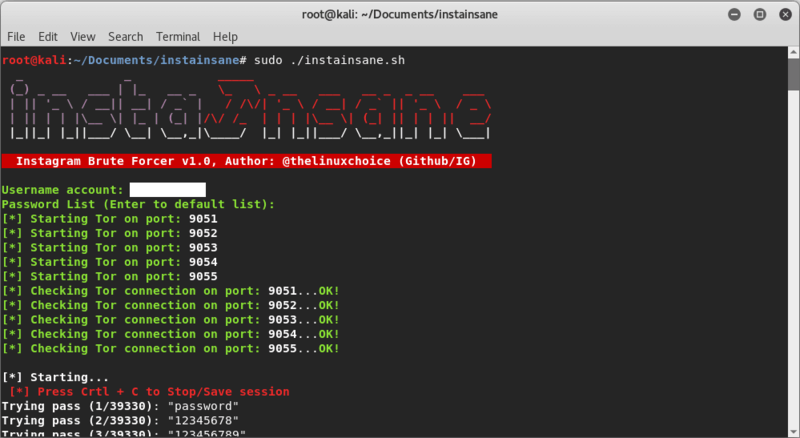 The Instainsane script requires basically Tor as a dependency, so you will need to have Tor installed on your system. Tor is short for The Onion Router (thus the logo) and was initially a worldwide network of servers developed with the U.S. Navy that enabled people to browse the internet anonymously. Now, it's a non-profit organization whose main purpose is the research and development of online privacy tools. The Tor network disguises your identity by moving your traffic across different Tor servers, and encrypting that traffic so it isn't traced back to you. Anyone who tries would see traffic coming from random nodes on the Tor network, rather than your computer. This will install Tor and the other dependencies if they aren't installed. This will start instainsane and it will prompt for the username of the instagram account that you want to attack. After providing it, it will start multiple instances of Tor in the background and will start the attack using the passwords.lst list file provided in the default repository of the project (if you want to use another list, the script will prompt its path at the beginning). Then, as mentioned the attack will start and won't stop until the list of passwords ends or you stop it. You can pause it as well and store the session, so the next time you start it, it will start in the same place where you left it before. The script uses an Android ApkSignature to perform authentication in addition using TOR instances to avoid blocking. The script uses Instagram-py algorithm (Python), see the project at: https://github.com/antony-jr/instagram-py.